I am back again writing a review about another Bella and Bear product. I always get really excited when receiving Bella and Bear products because I always love them and they never disappoint with their products. 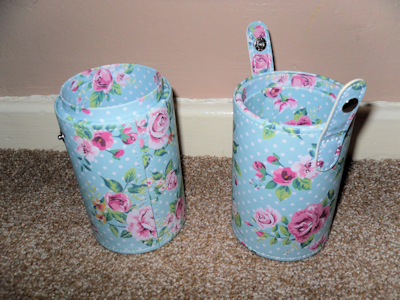 This time round I was given a makeup brush holder. For my birthday you would have seen that I was given a little desk for my makeup and a vanity case, My desk was very bare with just my mirror on it and so when I was asked if I wanted to review the make up brush holder I was very excited to receive it and finally put things together on my desk and FINALLY find some storage for my makeup brushes. 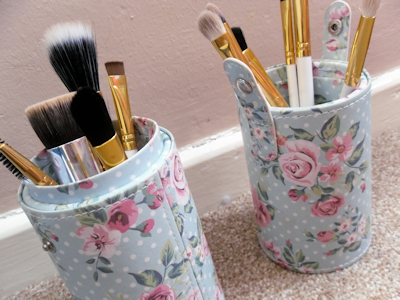 Take care of your Makeup Brushes with a quality brush holder. Lets face it your Brushes are expensive and what better way to protect them than with a fully enclosed brush cup holder. -Fully enclosed to keep your brushes protected from dust, moisture and any other harmful material. -Great Travel Brush Holder, tough enough to stand plenty of punishment but elegant enough to grace your vanity top with style. 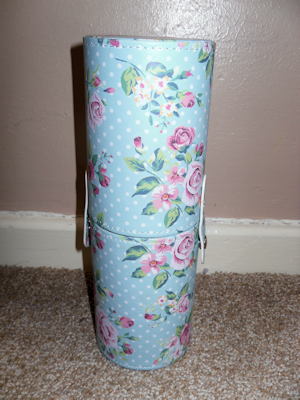 -Also makes a pretty organiser for your desk. New Product CHIC HIGH QUALITY MAKEUP BRUSH HOLDER- Bella and Bear’s vintage pattern and quality construction make this Travel Brush Cup Holder the perfect solution for your Makeup Brush storage and travel problems. SIMPLE ELEGANT DESIGN- your cosmetic brush holder will hold a complete set of brushes securely and in style, it looks great on your vanity and the clip on top means its easy to cover your brushes for travel or just to keep them clean at home. LIGHTWEIGHT COMPACT AND STRONG- enough to protect your expensive brushes no matter where you are, don’t leave things to chance and you don’t need to worry about loosing or damaging a brush again. I always start off by saying about Bella and Bear’s beautiful vintage trademark pattern I LOVE IT. I say this about all of Bella and Bear’s products but the pattern is gorgeous it is really girly and totally me. It looks perfect on my makeup desk and really adds to it making it look girly and beautiful. 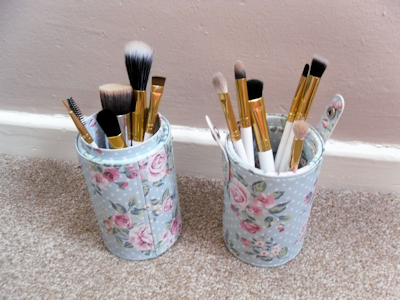 I stay at my Nans regularly and I have been to Southampton recently and It was so easy to just take all my makeup brushes I needed and put them in the holder and put it together and done away they came with me. This way I don’t have to limit and narrow down the amount of brushes I take travelling with me. What I love more is that when I stay at home I can put it into two pots and have them sitting on my desk with the brushes in it looks amazing on my table and really compliments it and I always get asked about my Bella and Bear products. I am so happy to have had this storage for my brushes because I was just going to buy a plain black holder but it look so much prettier this way and I can take it on my travels or have it in two halves on my table. One thing that I am extremely happy about is that is strong and sturdy. My makeup brushes are secure and do not get squished whilst travelling which is amazing because I’d often take makeup brushes out and they would be squished and out of shape with the bristles at every which angle (most annoying). I can fit in full sized brushes and mini brushes which is brilliant and it also holds a lot of brushes which is good because being a girl I have far too many brushes (oops). It is so practical as well which is something else I love. I was also surprised to see that when I put full sized brushes into the holder it didn’t fall over which a huge plus is because my brushes seem to be heavier than any other brushes I have. 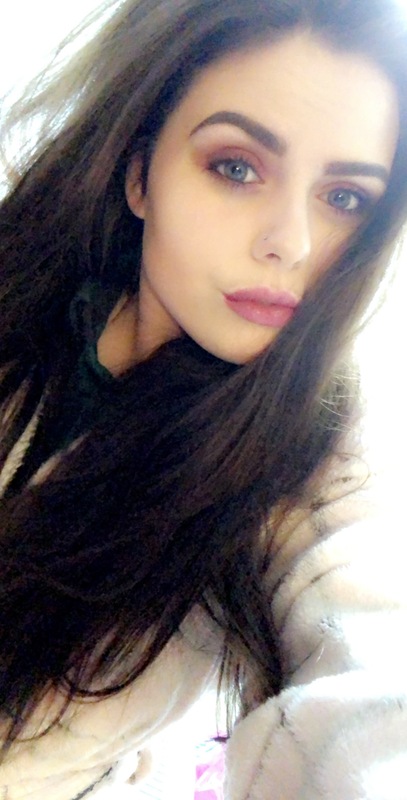 It is also made out of a material which is easily clean which means if I accidently spill foundation which I often do It just wipes off really easier and doesn’t stain. I would definitely recommend this product to all other girls who are looking for a makeup brush holder which is cute, sturdy, and hardwearing and compliments their makeup table.